Well, school ended, Bar Mitzvah was incredible, family has come and gone. That means I get to begin to find a summer vacation routine. I had two things on my list to do. First, create my page for Sketches in Thyme. Second, submit a page to Scrap Our Stash for the About Our Guys challenge. Wow, I haven't participated in a challenge in over a month. Sure feels good to be back! I chose to turn it into a single page LO. I had the idea to use these photos when I saw this sketch. Actually, this sketch lends itself to a lot of photos that I have. It's a great sketch for sequential photos. i don't usually use the little 3x4 cards on one side of a PP, but this time I did. They worked great with this sketch. I kept this LO pretty simple. I thought the brads added a bit of texture and some details. Oh, and there are definitely more than 5! Thanks for stopping today. Be sure and check out this week's sketch at Sketches in Thyme. There's still some time left to enter your LO at Scrap Our Stash too! Hi Devra; You made a perfect halfcircle with all these pretty little brads! Thanks for making the best of the challenge at Scrap Our Stash and welcome back! 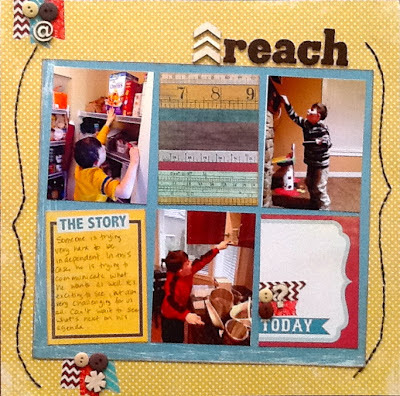 Great layouts Devra and you "aced" the one for Scrap Our Stash with the use of your brad stash! Thank you so much for playing along with us this month! Super layouts! I really like how you turned your layout into a one page....great colors, elements, and stitching! Love the brads in the second layout, such fun photos!